George Rawlings was the only son of another Old Bloxhamist, Harry Rawlings, who was a Coal Merchant from Portsmouth, and his wife Emma. He was a pupil at the school between 1906-1910 and sadly nothing is known of his time after leaving the school. He was commissioned as a 2nd Lieutenant into the 1/4 Battalion The Hampshire Regiment on the 9th November 1914., This was a Territorial Battalion. 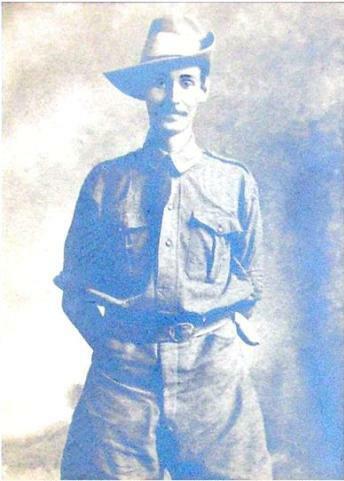 In December 1914, the Battalion proceeded overseas to India where he remained for almost a year and a half. In March 1916, he was sent to the Middle East where he served in the terrible heat of Mesopotamia. This oft forgotten theatre of War was a truly terrible place in which to fight, the stifling heat combined with disease must have been unbearable. "I am writing to express to you and Mrs Rawlings my very great sympathy at the death of your son. As his CO for nearly two months, I saw a good deal of him, and was very soon captivated by his wonderful charm......his sudden death at the hands of a Turkish sniper at a time when the Regiment was not actually engaged came as a terrible blow to every one of us. ...Owing to the fact that we were with 200 yards of the enemy we were forced to bury him just before dawn behind the trench, but the enemy have now been driven back and I was able a day or so back to recognise his grave and it has been tidied up and marked with a wooden cross." He was 23 years old when he died. When father laid the carpet on the stairs. The following month he appeared in the one act farce A Silent System; unusually, the production was taken on a short tour in aid of charity, being staged in Chipping Norton, Wigginton, and Adderbury. This was clearly a success, as it was put on again two years later at the school with a different cast of six characters, three of whom would perish in the coming war, Frank Hart, Philip Davy and Kingsley Fradd. He also got involved in debating as Vice-President of the Debating Society (the President was a member of staff, Mr Attwood, who produced the plays Ralph appeared in and was the moving spirit behind the school’s cultural life at the time). Ralph proposed the motion ‘That in the opinion of this House, Conscription should be introduced into Great Britain and Ireland, based on one of the foreign systems now in force’ on 18 February 1909. The motion was carried 17-4, reflecting the widespread concern among the British people about the growing prospect of war. The previous week he opposed the motion ‘That in the opinion of this house Mathematics form a better training for the mind than Classics’, arguing that ‘classics constituted the most interesting form of training, because the beautiful and interesting works of Virgil, Homer, and other great classical authors were bound to raise the enthusiasm of man or boy more than simply adding up strings of figures.’ The motion was carried 12-5. By this time Ralph had gained his remove to the Sixth Form (in September 1907) and was made a Prefect in May 1908. He gained Third Class Junior Honours in the Oxford Locals in 1908 and passed the senior version and won the sixth form Divinity and Latin prizes in his final year. Ralph appears to have been less involved in sport, though it was virtually impossible to avoid spending a great deal of time on football and cricket at a school like Bloxham during this period. At the athletic sports in May 1907, he reached the semi-finals of the junior 100 yards, but failed to progress to the final and never again made any impact on Sports Day. He played in the forwards for the Second XI in a 4-1 win against MCS Oxford in 1908, scoring the opening goal, and again against Abingdon the following month. This time the game was lost 1-0. The Bloxhamist opined that ‘in the second half (he) did a lot of useful work but is somewhat clumsy.’ Four of the team that day would perish in the coming war – Cunliffe, Sawyer, Rawlings and Hill. He played football in the Dormitory Cup (the forerunner of house matches) for dormitories I and III in February 1909, losing 10-0 to what was judged to be the strongest dormitory side yet seen at the school, II and V. This represented a decline from the previous year’s 4-1 loss to the same team. 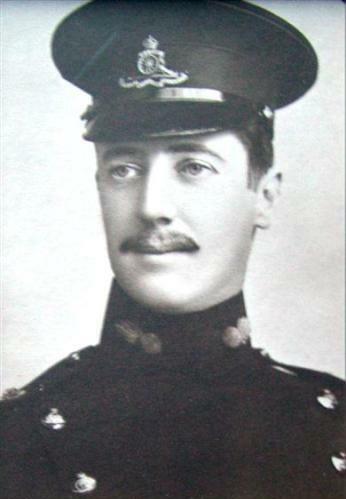 On leaving Bloxham in July 1909, Ralph emigrated to South Africa where he enlisted in the British South African Police as a Corporal; according to the Bloxhamist following his death, ‘he gained the admiration and respect of his comrades and popularity from the colonists and natives of his district. Those who remember him as a boy at School will agree that he deserved both if he maintained the character which distinguished him in those earlier years of his life, and there is every reason to believe that he did so.’ At the outbreak of War he was commissioned into the 1st Battalion the Kings African Rifles, one of two Nyasaland battalions, and served with them throughout the East African campaign, being commissioned in the field. ‘I am sorry I have not written before, but the Germans have kept us very busily engaged. They suddenly swarmed down upon us and completely invested our little column at _______ , cutting us off from the outer world for eight days. We had to live in trenches in this terrible country —the heat awful and we only 500 feet above sea level. It was rather rotten, and food getting low on the eighth day. We decided to move out before dawn in two parties and try to disperse the Huns, who seemed to be on every rise. It was completely successful. I was with forty men of A company. We charged a German position with fixed bayonets at 5.30 a.m. We captured two machine-guns, killed four whites and twenty Askaris and took another twenty prisoners; the rest fled for their lives. The position was held by fifteen whites, 150 Askaris, and three machine-guns, and we were 44! I however lost my greatest friend and fellow-scout Judson. He was the best and bravest man I knew, and we were always together. The poor fellow died two minutes after he was hit, as I was trying to bandage him in a rifle-pit. It will take me a long time to get over this, as we were such close friends and understood each other so well. As for the rest of the battle, it was equally successful; the Germans fled in all directions, their known casualties being 200, which is good, considering how small our columns are out here. We also captured one field-gun and four maxims. This should make _______stir himself a bit; the ______Force is very slow. Out scouting one night during the siege I and another fellow got separated from the rest of our patrol after we were fired on. We lost our way in the darkness and got somehow behind one of the enemy's lines. We could hear them coughing all night and dared not move an inch. 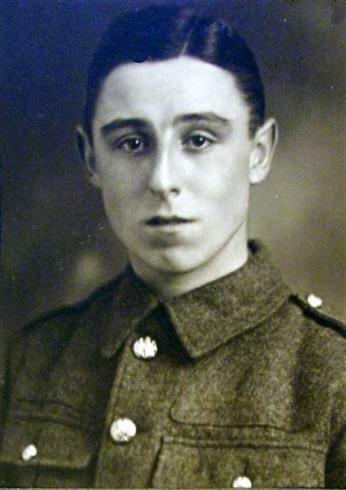 Ralph was awarded the Distinguished Conduct Medal (DCM, the oldest British award for gallantry) for his part in this action, the London Gazette recording that it was awarded ‘for conspicuous gallantry and devotion to duty in carrying out dangerous reconnaissance; on one occasion, accompanied by another man he penetrated the enemy’s position and captured an outpost, obtaining most valuable information which enabled a successful attack to be made.’ He was also twice mentioned in despatches during the campaign, including for the action in which he lost his life. On 19 February 1917, Hill’s company, commanded by Captain A.C. Masters, was in action a few miles south of Tandala in western Tanganyika, defending a position in the hills from an attack by German troops under the command of Captain Max Wintgens, who was advancing from the border of Northern Rhodesia towards British East Africa with a force of 524 Askaris, 13 machine guns and three field guns, as well as hundreds of porters. In the early morning darkness, Hill’s outpost came under heavy attack from the Germans. When daylight came Wintgens deployed two companies of infantry and several machine guns, assisted by shell fire from a field gun. The main German assault fell on the two British machine guns, posted on a small hill covering the right flank of Masters’ position. By mid-afternoon the hill had been overrun following a bayonet charge. Half the KAR had become casualties, but they had delayed the German assault and Corporal Stima and Private Saidi, the only men to survive from their detachment, had managed to disable the machine guns before they were forced to withdraw. According to the KAR report on the action, ‘Masters then extracted his force, having lost two officers and seven other ranks, 18 wounded and 8 missing.’ Hill was one of the two officers. It should be noted that while Hill appears to have died in the early morning of 20 February (the date recorded in the Bloxhamist), the Commonwealth War Graves Commission records his death as taking place on 19 February, and as is usual in such a case, this is the date we have taken as official. 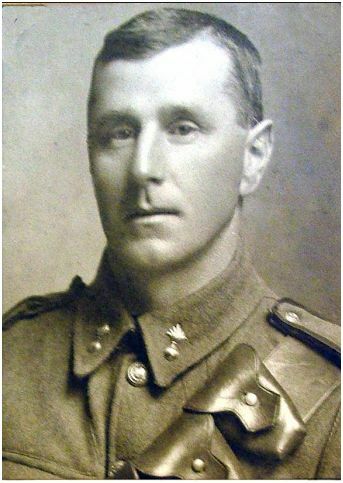 General Northey paid ample tribute to the role played by Ralph Hill ‘fighting one against ten for twelve hours’ in his despatch following the combat. ‘I held a spur running east and west on west side of road with one platoon and two machine-guns under Lieut. Hill on the highest point. My left flank was held by Lieut. Jackson's party and the Lewis gun. At 3.45 a.m. the enemy advanced and fired on my pickets. This party, apparently a strong advance guard of about one company, pressed forward right up to my position and came under very heavy fire in a nullah* about 100 yards to my front, being enfiladed by Lieut. Hill. The enemy suffered severely here, as he fulfilled my expectations by pressing straight up the road whence my position was concealed. One dead European was found in this gully and several Askari. After daybreak I sent a party forward into the gully and the enemy then called out that they wished to surrender, but seeing six of my men coming down to them, they opened a heavy fire upon them. We dispersed them and took four Askari prisoners, and saw many killed and wounded which we were unable to move. The delay imposed on the Germans by the KAR at Tandala proved to be of crucial importance. The arrival of the rest of the 1st Battalion over the next two days forced Wintgens to withdraw to the northwest and ultimately to abandon his advance, though his force would not finally be surrounded and forced to surrender until early October 1917. 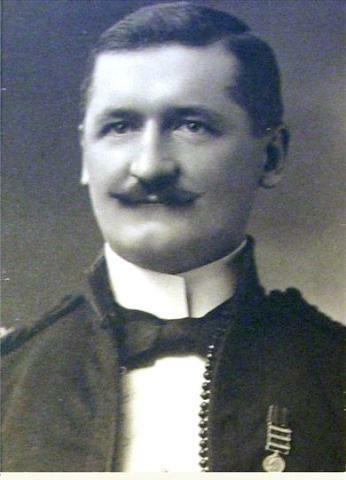 Von Lettow-Vorbeck eluded the Allied forces, led by the South African Major-General Jacob van Deventer, by crossing into Portuguese East Africa in November 1917 and carried on his campaign by living off Portuguese supplies for the next year. 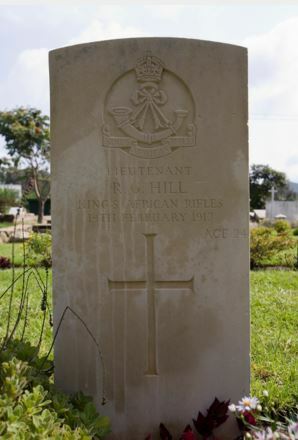 Ralph Hill is buried in Iringa Cemetery, Tanzania. He was 24 years of age when he died. Ralph’s friend Jack Judson of the British South African Police, who was killed in action on 30 October 1916, lies in the same cemetery. Herbert Cooper was a pupil at the school between 1912-1914 and was the only son of Henry Bidlake, a Chemist and his wife, and was shown as living at Redhill in Surrey. On leaving the school Bidlake progressed to the University of Leeds, where it is thought he followed in his fathers footsteps and studied Chemistry. At the outbreak of War he applied for a commisson but was rejected on account of his age of only 17. He first joined the Army Service Corps, before he finally gained his commission in March 1915, and arrived with the regiment on active service on the 10th August 1916. He was wounded by gunfire in December 1916 and spent some time on convalescence in Egypt, but returned to his regiment as soon as he was able to. In January 1917 he was promoted to acting Captain in command of a company. There are no other details other than he was killed in action on the 25th February 1917 when his Lewis gun position was over run by Turkish forces.. His body was never found and he was commemorated on the Basra Memorial. He was 20 years old when he died. Arthur Bigwood was the only son of Theodore Charles Bigwood and his wife Mary, and he lived at 23, Compton Road in Wolverhampton. Arthur was employed as an Assistant Engineer at his father's metal working business in Smethwick. He was a pupil at the school between 1902-1904 and the school records remark with some sadness that he was a pupil who left the school and did not return nor did he remain in contact with them. He joined the Royal Engineers at the start of the War, as Sapper 40301 and he served initially in the UK, before arriving in France on the 12th May 1915. He served with the Regiment throughout and his athleticism saw him take up a position as a Battalion runner. This was an extremely dangerous role which involved taking messages on foot between the Battalion and HQ or behind the lines - it often involved crossing terrain that was swept with Machine Gun fire or Artillery. 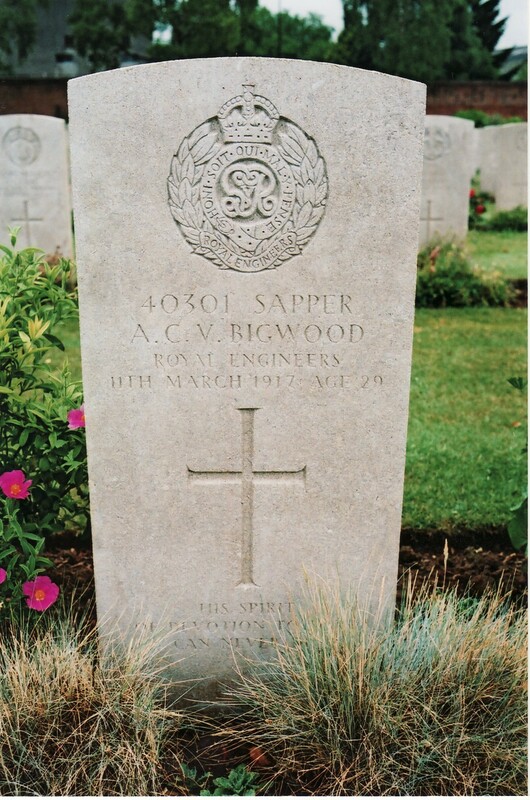 Bigwood fulfilled this role with distinction throughout the hell of the Somme and his devotion to duty and success was noted by senior officers. His efforts throughout this most difficult period left him mentally and physically exhausted. It was remarked that he never once failed to deliver a message given to him. On the morning of the 11th March 1917, Bigwood was taking a message by bicycle when the Battalion was in trenches near Arras, when he stopped to perform maintenance or clean his bicycle. He was hit in the back by shrapnel from artillery fire and died instantly, his spine being severed. He was buried by the Regimental chaplain and a number of his friends attended the ceremony, his grave being marked with a hand carved wooden cross made by one of his friends. He was 29 years old when he died. Maurice Adams was a pupil at the school between 1898 - 1900, and was the son the Reverend Canon James Adams, of Kill Rectory, Straffan in County Kildare. He was born on the 21st January 1884. Very little is known about him, or what he did when he left the school, but we do know that for some time he served in the Wicklow Garrison Artillery. He ended up in New Zealand where his occupation was a Surfaceman - that is to say a manual labourer engaged in railway building. He emigrated at the start of the War, and enlisted at Tokomura Bay, Wellington, as driver 2/2350. He married a New Zealander Lily Carey and lived at 16, Werwent Street in Wellington. 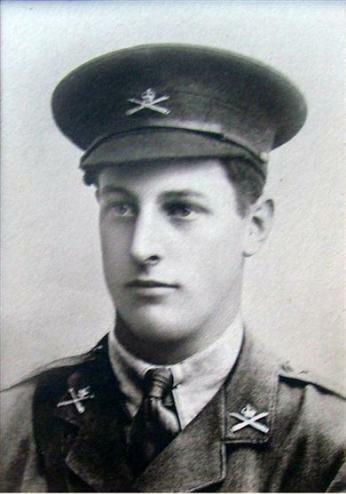 He enlisted into the New Zealand Field Artillery in August 1915 and sailed for Europe on the 15th November 1915. The Brigade travelled in two ships, the Willochra and the Tofua. They arrived in Egypt for training, where Maurice was admitted to hospital on 19th March 1916, one day after arriving. He remained in hospital for a month before rejoining his unit, making the long and convaluted journey to England via Marseilles and the infamous "Bull Ring" at Etaples. A period of training and remaining at base ensued, before he was once more admitted into hospital on the 5th October 1916 where he remained until November 11th 1916. He was then posted to his unit and finally arrived Belgium on the 31st March 1917. At this time preparations were well underway for the Battle of Messines, which was due to start on the 4th June. Maurice never made the offensive he was killed when his battery was shelled by the Germans on the morning of the 28th May 1917. There are some anomalies over Adams, most specifically over the photo of him in uniform which appears to show him wearing Royal Fusiliers collar badges - despite there being no record of this in his service record. He was 32 years old when he died, and is commemorated on a plaque in the church of Kill, in County Kildare. Richard Bolton was the son of Richard Hardy Bolton and came from Staverton in Northamptonshire, and was born on the 15th July 1894. He was a pupil at the school between 1908-1910. On leaving the school he emigrated to Canada where he pursued a career in farming, living in Winnepeg. 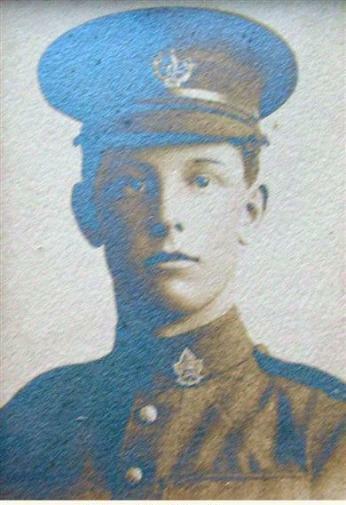 He joined the 8th Battalion the Canadian Infantry in March 1916 and served with them throughout. 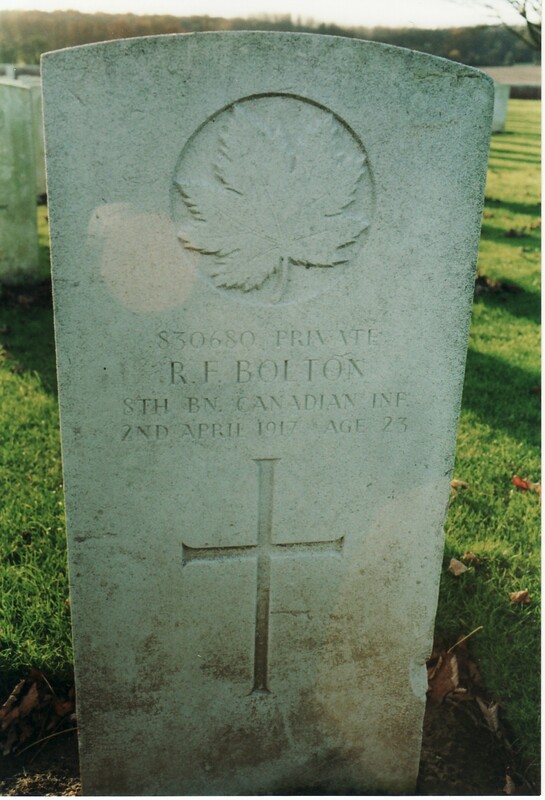 In April 1917, Bolton was working on the construction of a railway line which ran behind Vimy Ridge, in preparation for the Canadian assault on the ridge scheduled for Easter Sunday, the 9th April. It was during this process that he was killed by shell fire and is buried in Villers aux Bois cemetery. He was 22 years old when he died. 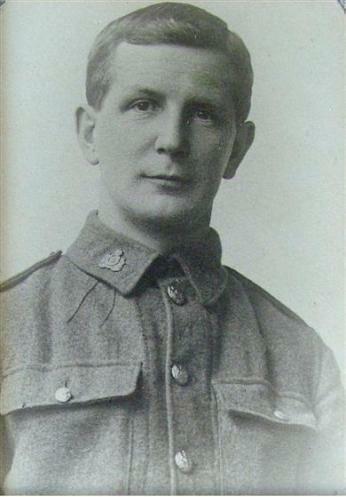 Thomas Turner was a pupil at Bloxham between 1891-1893, and on leaving the school headed for a career in the Army. He lived in Laindon, Essex and was a Church Warden and Lay Preacher at St Peter's, Nevendon. 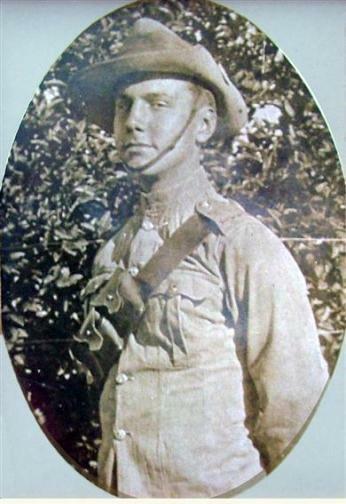 He served in the South African War, and it is not known what happened between then and 1914. 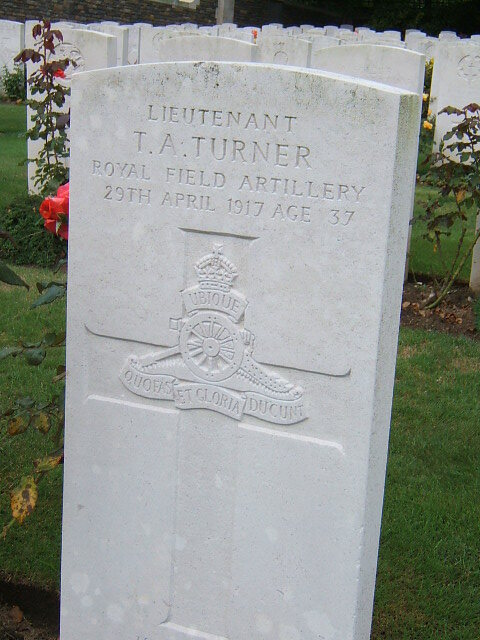 We do know that he was commissioned as a 2nd Lieutenant into the Royal Field Artillery on the 16th August 1915, having previously enlisted into the Royal Horse Artillery at the outbreak of the War. His Battery was on the front line near to Vimy in April 1917, and from the date of his death it seems likely that they were involved in what has become known as the Battle of Arleux. The Canadians had taken the bulk of Vimy Ridge, on Easter Sunday in driving sleet and snow, and after this intial success there were various pockets of resistance which needed to be cleared up. The Canadians managed to capture the village of Arleux, and the British finally managed to capture the village of Gavrelle, but had a much tougher time than the Canadians. They suffered terribly at the hands of the German artillery, and Thomas was killed with two other officers by a single shell. "What a strange mixture of civilization and brutality war is as waged in this campaign. It seems incredible that so short a time go as Christmas I was with you all. And I am now at the Front, most of you have friends and loved ones here as well, so my attempt to give you a few lines as to what life is like here, may be of interest to you. Our "home" where I write this, consists of a little wooden hut built of trees and bags filled with earth, and is in a large wood, which might be quite nice in Summer, when the Boche do not send us any compliments in the way of shells, but just now it is little more than a lake of mud. From here a walk of about one mile over desolate country takes one into the fire trenches. You must not imagine them as resembling anything you may have seen in your neighbourhood. Try to imagine what a rabbit warren would look like if you left it undisturbed for months, but then substitute rabbits for men, and you would have some idea of the life that we lead. Holes buried in the ground provide bedrooms, kitchens and parlours, whilst here and there a gramaphone can be heard reeling off some well known popular refrain. During the day things are more or less quiet, but when dusk comes, activity on both sides becomes more noticeable. Huns, are by no means the only creatures to be killed, for rats come out in their hundreds. A sergeant of a famous regiment proudly showed me yesterday a bag of 20 which he had made with the help of a little terrier he possesses. I wish it were as easy to kill our larger enemy, but of course, one has to be careful that he doesn't kill you first. Another interesting excavation is the TP, or Trench Post Office, carefully protected by hundreds of sandbags, here letters and parcels are sorted , and then distributed to eager recipients. Life would indeed be dull without these messages of home to cheer the men in their monontonous vigil. I will now say goodbye. Always yours, Thos A Turner"
He is commemorated with a magnificent carved wooden choir stall in the church at St Peter's, Nevendon. 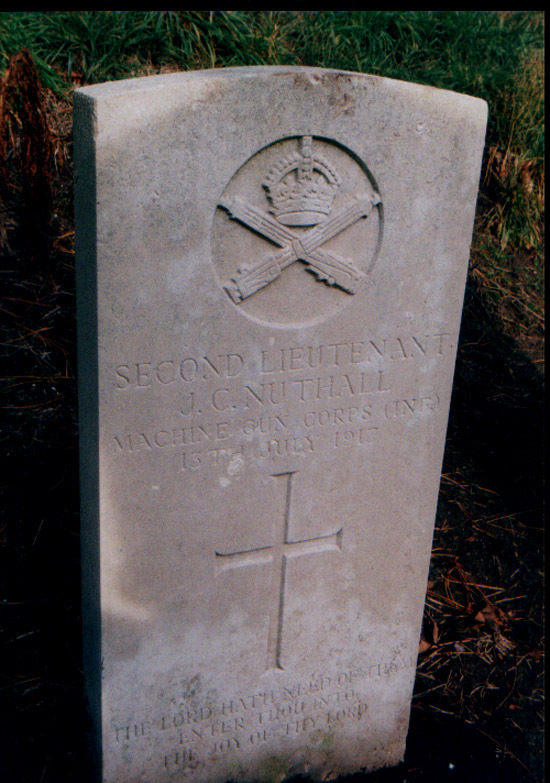 John Nuthall was the son of Arthur John Nuthall and his wife Constance Pritchard Nuthall, and was born on the 12th November 1888 at Assam in India where his father ran a tea plantation. He was educated at Clifton College in Bristol and then progressed to Durham University, where he studied Classics. 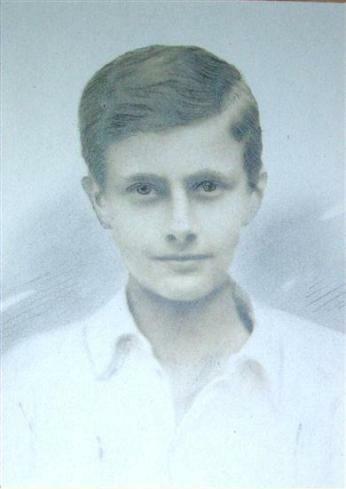 Upon his graduation he became the Classics Master at Bloxham in 1912 and he remained in the post until 1914, upon which time he left in order to marry. He was a formidable sportsman, high proficient at Cricket and Football, and was also the Editor of the Bloxhamist during his time at the school. He was described as being thoroughly decent and likeable, and a quintessential English gent. His wife to be, was Evelyn Ormond, the 3rd daughter of Richard Ormond, a merchant and silk dealer from Pembroke. He was married in Cheriton Church on the 30th July 1915, and then took up a post as a Master at a prep school near to East Grinstead in Surrey. In 1916 he enlisted into the Inns Of Court Officer Training Corps, and was finally gazetted as a 2nd Lieutenant in the Machine Gun Corps on the 5th September 1916. He progressed into service with the Machine Gun Corps to Belgium in April 1917 and it was serving with them in July 1917 that he was part of a ration party, tasked to bring food from the relatively safe town of Nieuport on the Belgian coast up into the trenches. On leaving Nieuport, he was struck by shrapnel, and despite the best efforts of medial staff he died in an Ambulance on route to a field hospital. He was 28 years old when he died, and is buried in Coxyde Cemetery, Belgium. 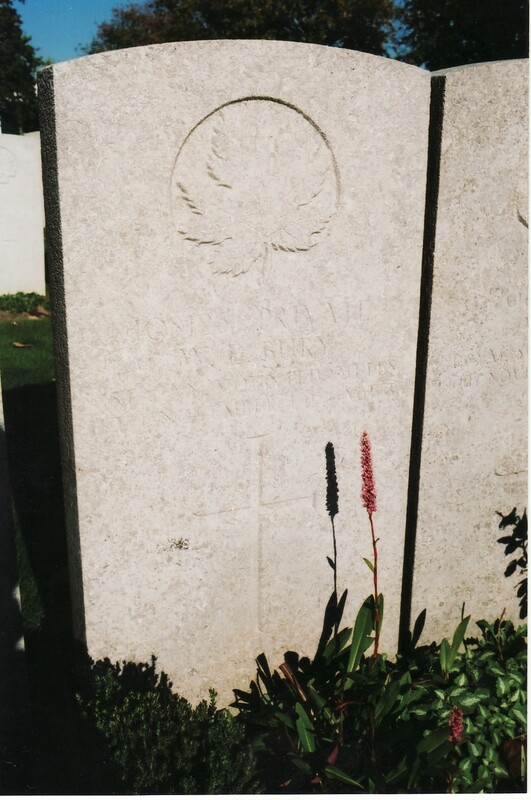 Also buried there is a Lieutenant WAM Boissier, who was the son of the Headmaster of Bloxham. 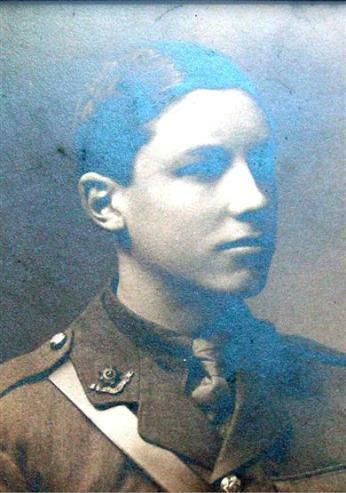 The page on the memorial website Every Man Remembered for John Simons, a young man from Dunstable in Bedfordshire indicates that he was educated at Bloxham School before going onto Dunstable Grammar School, and this sole reference is what has now led to his being identified as missing from our war memorial. 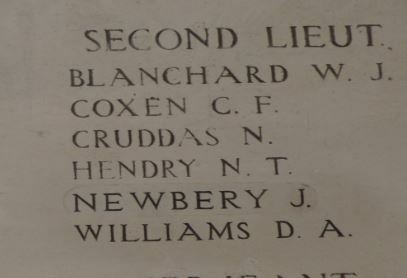 He is also missing from the school’s Roll of Honour, listing those Old Bloxhamists who served during the Great War, hardly surprising given that he left Bloxham at the age of only 13. Clearly the school lost touch with him completely, and was wholly unaware at the time, and since, that he had fought and died in the Great War. The website Ashton at War, drawn up by Ashton C of E Middle School in Dunstable (an impressive piece of work) makes no mention of John’s time at Bloxham. However, recourse to his school record card confirms that he was – briefly - a pupil at Bloxham School. 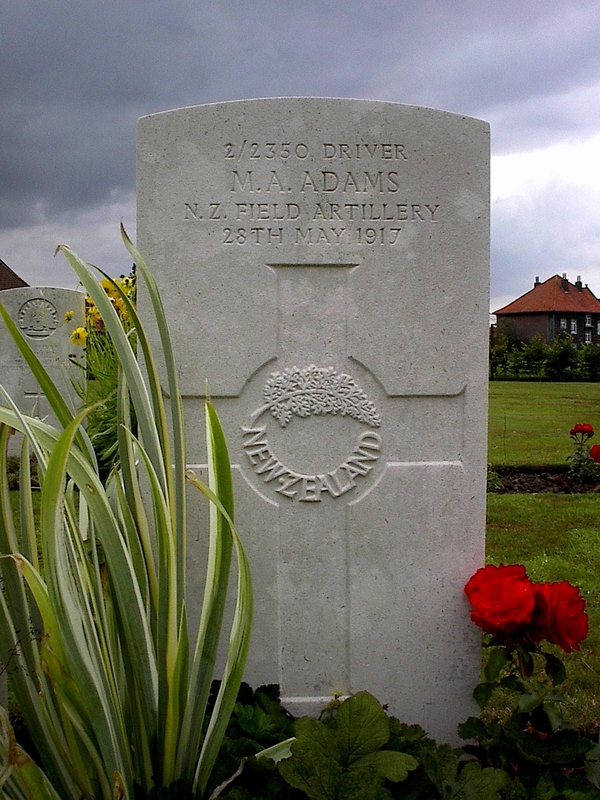 He has the same three names as the man listed in the Commonwealth War Graves Commission’s records, and the same date of birth, and his father’s name and address are the same. John Henry Stuart Simons was born on 26 June 1896, at High Street, Markyate, the son of Henry Edgar Simons, a Farmer and Agnes Louisa Simons (nee Jones). By the time of their son’s death, they had moved to Turner's Hall, Kinsbourne Green, Luton. John was only at Bloxham very briefly, from September 1898 to July 1909, one school year. He had a brother, GT Simons, who arrived and left at the same time. The only reference in the Bloxhamist to John is to his cricket; he and his brother both played in Division III. In those days, the school put all its efforts into the 1st XI, so there were no opportunities for the younger boys to play in matches against other schools. Whether in Division II, III or IV, they therefore had to make do with a regular diet of internal matches. Playing alongside his brother and a number of boys who would perish like him in the coming war – Peecock, Gepp, Rylands, Barrow – John is recorded as having mustered a meagre eight runs in five matches in the summer term of 1909. That is the sum total of his recorded impact at the school, and he sadly does not appear in any school photographs from his one year here. John went on to Dunstable Grammar School, which had been founded in 1888 by its first headmaster Lionel Thring, a member of the same family as Edward Thring, founder of Uppingham School and creator of the Headmasters’ Conference. The school had approximately 60 boarders and 100 day boys when John arrived there in September 1909. The school closed in 1971 with the onset of comprehensive education, and after 1973 the buildings were used by Ashton Middle School. Among the 62 names on the war memorial in the school library was that of John Simons, as well as that of Ashton Edward Thring, the only son of the school's founder. On leaving school in 1912 John went into the family farming business. 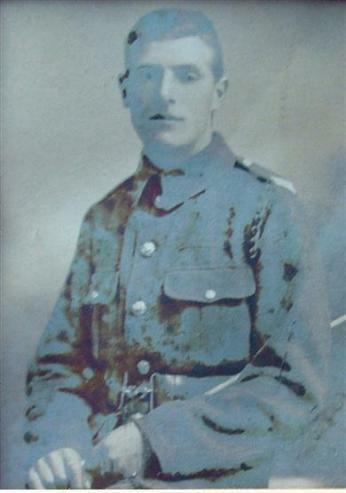 When war came two years later, he enlisted with the Bedfordshire Yeomanry on 11 September 1914. He was subsequently commissioned into the 3rd Officer Cadet Battalion before joining the 1st Battalion, Northamptonshire Regiment on 4 November 1916. 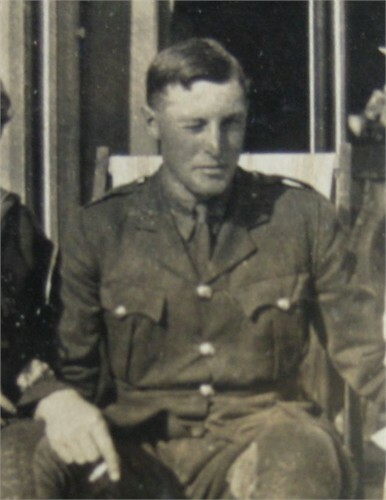 According to Ashton at War, in early 1917 he transferred to the Labour Corps, which tended to be manned by officers and other ranks who had been medically rated below the "A1" condition needed for front line service. Many were men who had returned to the front after recovering from wounds. These units were often engaged, often for long periods, in work within range of the enemy guns. The Corps always suffered from its treatment as something of a second class organisation: for example, the men who died are commemorated under their original regiment, with the Corps being secondary, which makes it difficult to research men of the Labour Corps. In addition, few records remain of the daily activities and locations of Corps units. This issue of John’s time in the Labour Corps requires further research in the archives if possible to make sense of what precisely his role was. On 20 June 1917 the British XV Corps took over the French sector on the Belgian coast at the very end of the Allied trench system, prompting the Germans to begin planning Operation Strandfest, a pre-emptive strike to eliminate the Yser bridgehead. At 5.30am on 10 July the massed German artillery, including three 24cm naval guns in shore batteries and 58 artillery batteries opened up on the British positions in the bridgehead where mustard gas was used for the first time. All but one of the bridges over the Yser River were demolished, isolating the 1st Northants on the extreme left flank. Telephone communication was also cut. The German bombardment continued throughout the day. The British artillery attempted a counter-barrage but several guns were knocked out and the German infantry were well protected. At 8pm, the Germans launched their infantry assault, by which time the two British battalions had suffered 70-80% casualties. The Germans attacked down the coast, outflanking the British and followed up with waves of German Marines, supported by flamethrower teams to mop up dugouts. The British battalions were overwhelmed, only 4 officers and 64 other ranks managed to reach the west bank of the Yser. John's body was never recovered. Captain Hayes of the RAMC later reported "Simons was killed, we found a man on the way who was in the dugout when Simons was hit by a bomb." John is commemorated on the Nieuport Memorial in the town of Nieuwpoort on the Belgian coast. Of the 566 names of Commonwealth officers and men on the memorial, over 260 were killed or mortally wounded in the fighting on 10 July 1917. 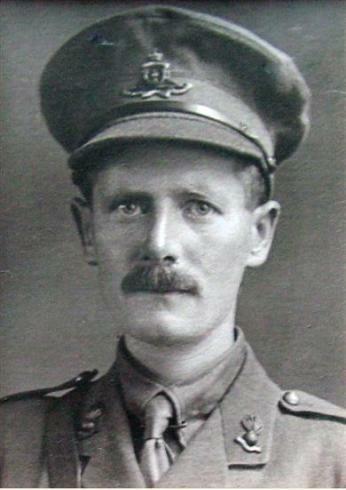 He is also commemorated on a memorial in St. Nicholas' Church, Harpenden, Hertfordshire, and at long last his name will be added to the Bloxham School War Memorial as the 80th name on the list. The photograph was kindly provided by Dorothy Hemmings, a distant relative and is taken from an scan of the original which has now sadly been lost. Charles Morris was born on 22nd September 1895 and was the second son of Henry William George (Will) Morris, a chemist and druggist from Charlbury, and his New Zealand born wife Anna, known as ‘Nan’, whom he married in Dorset in 1889. Charles had a brother, Cyril, who was three years older than him and who also attended Bloxham School. The family moved around a good deal with Will’s work; at the time of Charles’ birth the young couple were living in Thame, but by the time of the 1901 census they were in 55 Market Street, Charlbury with two young sons. They are later recorded as living at 18 High Street in Chipping Norton, which is where they were when the two boys were at Bloxham. When Will retired in 1913 the family moved to Creake House in Abingdon. 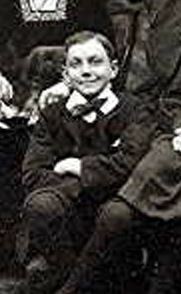 Charles was a pupil at the school from 1905-1912, leaving two years after his brother. Cyril was a notable cricketer, earning his colours in 1908 when only fifteen years of age, and heading the bowling averages in his final season (1910). 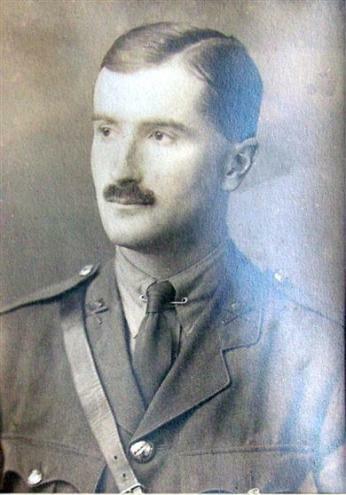 Charles – listed in school records as R Morris to distinguish him from his older brother – was quickly noticed for his cricketing prowess, along with another boy who would perish in the Great War – ‘R. Morris and Davy are most promising, the former for his size doing wonders.’ This early promise did not lead to later success at the game, and he never emulated his brother’s feats for the Bloxham 1st XI. Instead he made some impression in the classroom, winning the Bernard Ashworth Prize in July 1911 for an essay on ‘Engineering of Today’. Charles left school in July 1912 and the Bloxhamist made no mention of him for the next five years. In early 1916, whilst he was working in the Godalming branch of Capital & Counties Bank (now Lloyds Bank) Charles enlisted into the 30th Battalion Royal Fusiliers (City of London Regt.). This was a reserve battalion for the 23/24 Sportsman’s Battalions – hence his service number SPTS/4826, but by 1917 he was serving with the 9th Battalion of the Royal Fusiliers, part of the 36th Brigade, 12th Division. 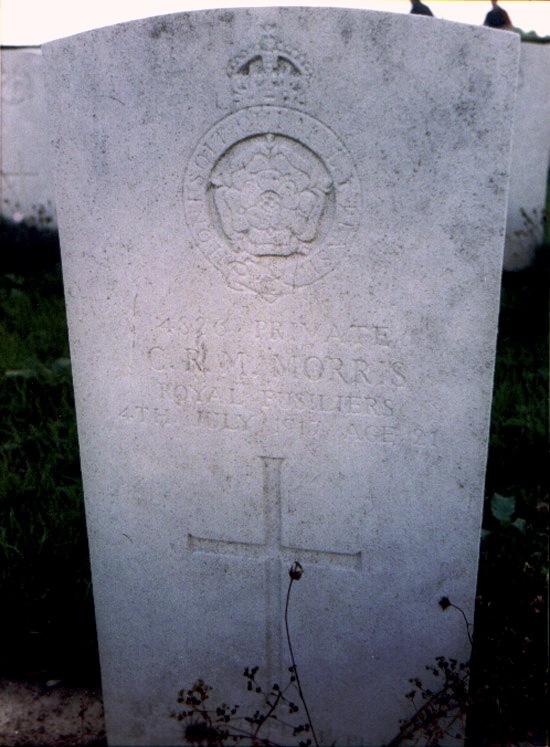 Charles Morris was aged 21 when he was killed, and is commemorated on the Bloxham School War memorial, the Appeal for which his mother contributed 10 shillings (‘in memoriam CRMM’). He is buried in Monchy Cemetery. His brother Cyril was a Captain in the 8th Royal Berkshires and was twice wounded, but survived the war, becoming a Chartered Accountant. Cyprian Borton, was the eldest son of the Reverend Neville Borton and his wife Annie and was born on the 15th August 1879 in Bloemfontein, South Africa. His father had been sent to South Africa along with 3 other priests in 1876, to provide spiritual support to the vast numbers of ex-pats who flocked to South Africa in the search for gold and diamonds. 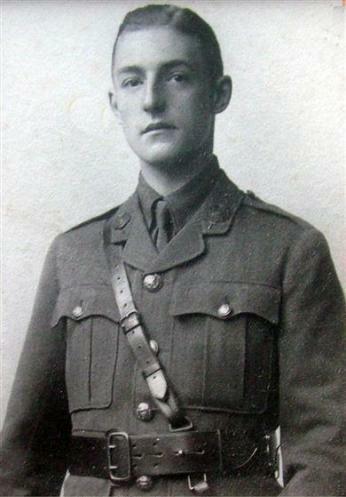 Borton was a career soldier and was a pupil at the school between 1890-1893 and on leaving the school he went to Felsted and then onto Selwyn College, Cambridge where he read medicine. He was an exceptional rower and a fine sportsman during his time at University. He was gazetted as a 2nd Lieutenant into the Worcestershire Regiment and served with distinction in the Boer War. He gained the Queens Medal with 3 clasps. On the 27th December 1912, he sailed from Liverpool on the City of Birmingham, bound for Bombay, where on arrival he obtained a commission into the Duke of Connaught's Own Baluchi's. He served all over India and the Far East. In 1913 he was seconded to the Malay Straits Guide, responsible for the safe passage of ships through the Malacca Straits outside Singapore. In 1915, he was sent with his regiment to Aden, where he was involved in the fighting against the Turks. He was reportedly killed by a Turkish sniper on the 2nd August 1917, aged 37. He is commemorated in Ma'ala Cemetery, Yemen, as well as on a memorial at Selwyn College and on a brass plaque in Taipaing, Malaysia. Geoffrey Marshall was the only son of William and Annie Marshall, who were farmers and millers and lived at The Manor House, Barchester in Warwickshire. He was a pupil at the school from 1906 - 1909. Geoffrey enlisted into the Oxford and Buckinghamshire Light Infantry on the 1st August 1914, finally arriving in France on the 29th March 1915. On the 27th May 1917 he was admitted into hospital in Rouen where he was diagnosed with malignant stomach cancer, and was subsequently dismissed from the Army on the grounds of ill health. He was transferred to England on the 18th May and his discharge was served in Warwick on the 16th June 1917. He was buried in Shennington on the 6th August 1917. 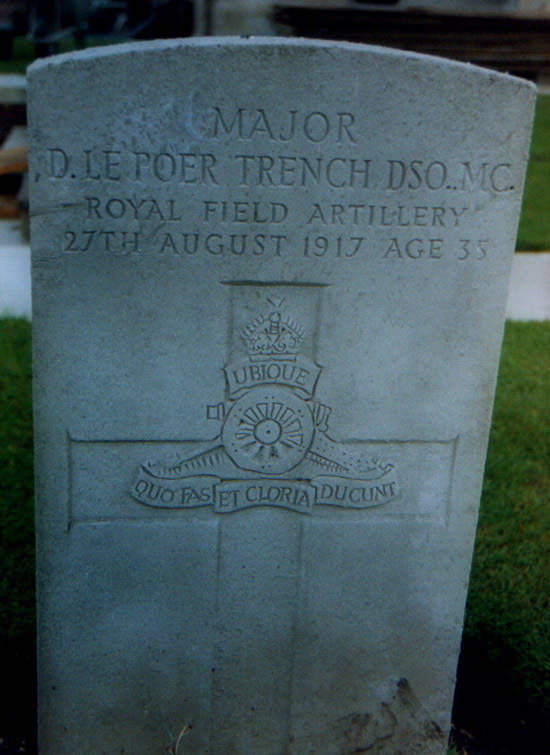 Derrick Le Poer Trench was a pupil at the school from 1893 - 1896 and came from a distinguished and landed family who were part of the gentry. The family had significant land owings in Ireland and the North of England. Despite the reputation of the family, it has been surprisingly hard to find out any information about Derrick himself. I do know that he was a career soldier who entered the Royal Military Academy, Woolwich in 1899, and progressed rapidly through the ranks. At the outbreak of WW1 Trench was a Captain in the Royal Field Artillery. He was promoted to Major in 1915, and throughout his time in action displayed remarkable bravery and resilience, being awarded a Military Cross, a Distinguished Service Order and being mentionned in despatches no less than 4 times. He was promoted to some very senior positions within the staff, including being an Adjutant to a Brigade, a divisional Brigade Major and also a staff officer to Brigadier General Sir Malcolm Peake. It was during the reconnaissance of Hill 70 near Loos, on the afternoon of the 27th August 1917 that both Peake and Trench were killed by shell fire. They are both buried in Noeux Les Mines cemetery. Trench was 35 years old when he died. 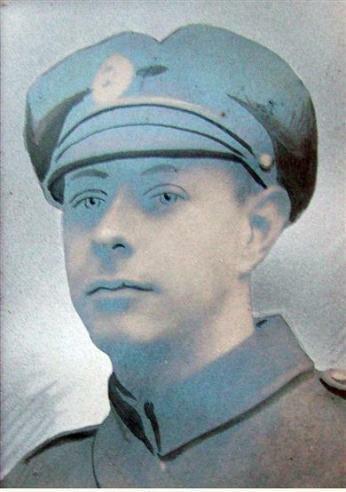 John Newbery Boschetti, as he was known when at school between January 1894 and July 1897, was a Trooper in 7 Squadron 2nd Imperial Light Horse, and went through the German South West Africa campaign with them. He joined the infantry for overseas service and went to Egypt with the South Africans and then to France. He won his Commission April 29 1917 for services in the field for the way he led and handled his platoon when there was no officer to lead them at Arras. He was wounded in Delville Wood in 1916 and killed in Flanders September 20th 1917. 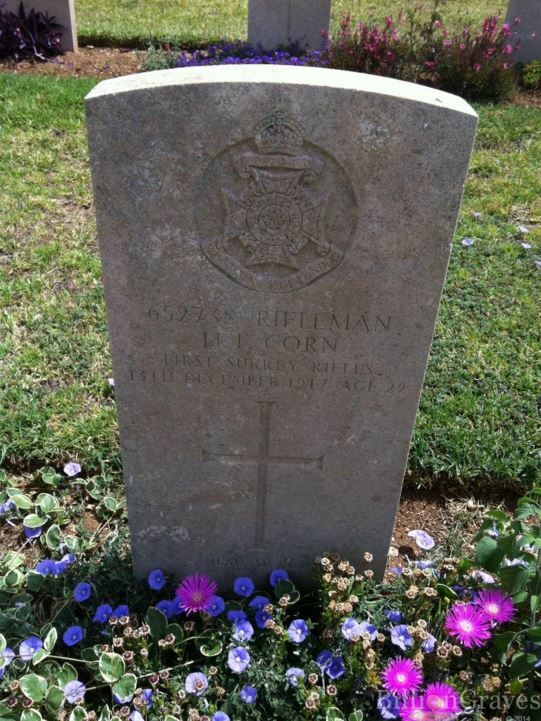 He was a Second Lieutenant in the 3rd Regiment 1st Brigade South African Infantry. He was aged 38 when died. He was a member of the school cricket 1stXI in 1896 and 1897. There was some considerable confusion over his identity, which was finally unravelled by Simon Batten. On graduating he emigrated to Canada where he entered into a career in farming at Vermilion in Alberta. At the outbreak of War he enlisted into the 1st Battalion the Canadian Mounted Infantry, and came with the regiment to England. He was wounded twice and spent some time in hospital before being wounded a third time, on this occasion fatally. He died in hospital on the 1st November 1917 aged 35. 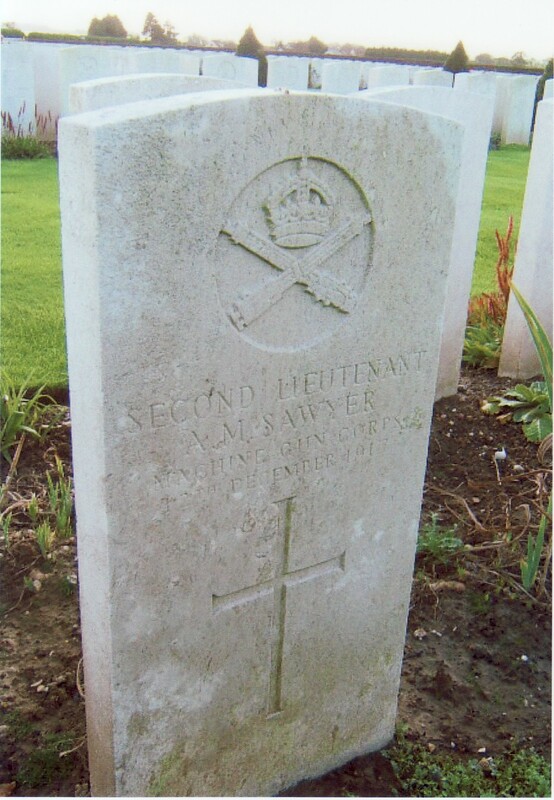 Aleck Mayson Sawyer was a pupil at the school between 1906-1910 and was the second son of Charles Montegue Sawyer, a cotton merchant from Birkdale in Lancaster, and his wife Margaret. Aleck had two older sisters, Constance and Alice and an older brother Charles. In 1901 the family was living in Trafalgar Road, Birkdale. Aleck was born on the 21st April 1894, and on leaving school he studied Agricaulture with the intention of moving to the Colonies. He had served 2 1/2 years as a Private in the Denbighshire Hussars, and on the outbreak of war he rejoined his regiment, and spent some time in Egypt, before he joined the Machine Gun Corps as a Private. He was subsequently commissioned as a 2nd Lieutenant into the 60th Machine Gun Corps and served in Belgium and subsequently France. The picture below was taken in the Summer of 1917 in the garden of his sister Constance's house. When compared with the fresh faced man in the formal picture to the right, the strain of 6 months in the trenches is clear to see. At some time in December 1917 Aleck was seriously wounded, his spine and arm being severed by gun fire, and he was rushed to hospital on the French coast. The War office issued a travel permit for his parents to travel to Le Treport to visit their seriously ill son. His mother requested that the permit be changed to allow his sister to accompany her mother over the France. The War Office responded by saying that the warrant would only be issued for parents and that the request be re sent. This bureaucracy meant that by the time the permit was issued Aleck was already dead. When the telegramme arrived, instead of a warrant his mother received the news that he was dead and the War Office extended their sympathy. The trauma she must have felt cannot be imagined. He is buried in Mont Houn Cemetery, France and was 22 years old when he died. I am grateful to his great neice for the picture of Aleck in his sisters garden. Harold Frank Corn was a pupil at the school between 1908-1912 and was the only son of Frank and Mary Corn who lived in Cuddington, Surrey. Frank, was employed at Lincoln's Inn, as a clerk in the Stewards Office. On leaving school it is not known what happened to Frank. 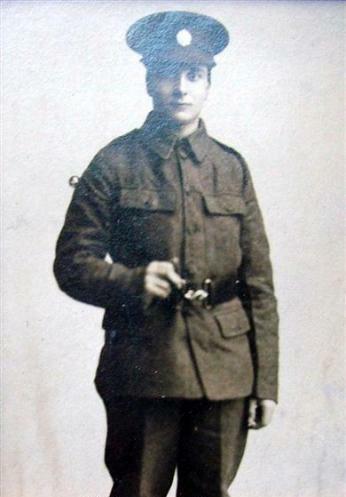 He enlisted on the 15th November 1915 into the London Rifle Brigade and he served with them until June 1916 when in preparation for the Somme offensive he was transferred into the 2/21 London Regiment, The First Surrey Rifles. He survived the Somme and in December 1916, he was sent to the often forgotten theatre of the War at Salonika. In April 1917 he was serving in Egypt before being sent to Palestine in the continuing fight against the Turks. On the afternoon of the 13th December 1917, he was shot through the chest and died instantly near Tower Hill on the outskirts of Bethlehem. He was 22 years old when he died. He is buried in the beautiful Mount of Olives cemetery - the furthest headstone visited in this project. Horace Kruger was a pupil at the school between 1903 and 1908. I have been unable to find out anything about his family, and I cannot find him on any census records. I have been able to establish that he was born on the 14th April 1892 in Las Palmas in the Canary Islands. On leaving the school he sailed to Chile where he worked as a motor mechanic in Valparaiso. When war broke out he sailed from Chile on the SS Orita, sailing via the Falkland Islands and landed in Liverpool in December 1914. He applied for a commmission into the Royal Naval Air Service, but not for the first time in his military career his severe stammer let him down. He joined the Royal Navy and sailed on board HMS President to the Dardanelles, where he took part in the Gallipoli campaign as part of the Royal Naval Division. He served until 1916 as a Petty Officer in the Naval Armoured Car Division. He left the service in June 1916 and applied once again for a commission with King Edwards Horse, but once again his stammering let him down. He served in the ranks in Ireland and then in France, and was recommended for a commission into the Royal Flying Corps, but his stammering failed him again, and he was refused a commission. He transferred into the Northumberland Fusiliers and volunteered to serve overseas. In December 1917 he was in Belgium, near the shell shattered village of Zonnebeke, when his company lost touch with the company on its left. Kruger offered to go and find them, and was never seen again. 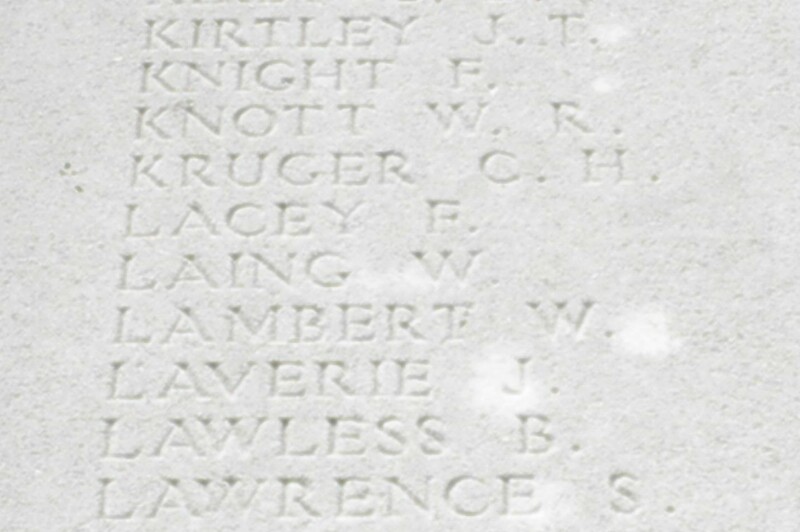 The Battalion War diary notes heavy shelling with gas shells on the afternoon of the 19th, and mentions that one OR was missing, presumed killed - probably Charles Kruger. He is commemorated on the Tyne Cot Memorial to the missing.